Wade Whimsies have become highly collectible over the years. 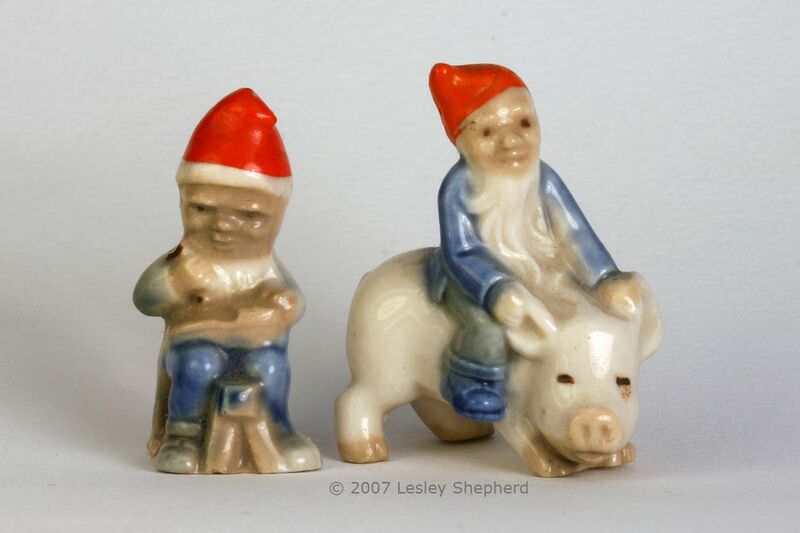 These miniature porcelain figurines were originally conceived as pocket friends for children, but now they're widely traded by collectors of all ages and budgets. Wade Whimsies were originally produced from 1954 through 1959 as small boxed collection sets. The Irish Branch of the Wade Group of Potteries in Portadown was struggling to find a new direction when the market for their electrical porcelain insulators crashed. Iris Strayker Carryer neé Wade, the wife of the factory's managing director and eldest daughter of George Wade, suggested that the factory turn its industrial production to tiny pottery figurines which were stamped "Wade, England." Beginning in Canada in 1967, many figurines were distributed free with packages of Red Rose Tea. Distribution continued with collections in the U.S. after 1983. Wade began producing Whimsies for individual sale again as boxed individual pieces or boxed sets from 1971 through 1984. Whimsies have been produced only as specially commissioned pieces since 1984. Wade also briefly produced a series of villages of miniature buildings called Whimsey on Why from 1980 through 1987. The buildings are highly collectible. An additional Irish Village, called Wade Bally-Whim, was produced from 1984 through 1987. How Do You Know It's Really a Wade? Whimsies have been produced with a number of backstamps, but some of the early pieces have no stamp at all so identifying them can be tricky. Wade, England originally ordered production of Irish leprechauns with a Wade, England backstamp for their Fairy Folk collection, but Iris, George Wade's daughter, felt that no Irish leprechaun should leave an Irish factory marked "Wade, England." Figures left the factory without marks for a while because of this. Pottery produced at Wade (Ulster) has a wide variety of markings including Celtic Porcelain by Wade, Ireland, Irish Porcelain, Co. Armagh, Shamrock Pottery, Made in Ireland, Made in Ireland by Wade, A Moko Line by Wade Ireland, and a number of other combinations. The best pieces are in perfect condition with sharp mold lines and no chips or glaze cracks. The molds were reused many times, so some figures don't have sharp definition and these should be avoided. Colors vary from a plain golden glaze to a golden glaze with colors added and the distinctive Irish Wade blue/gold glaze. Older Whimsies and newer commissioned pieces have bright, clear colors. Red Rose estimates that several million Wade Whimsies are in circulation through their distribution alone. This availability and the initial low cost—Whimsies were free with the purchase of a box of tea—means that Whimsies are widely collected in the U.S., Canada, and the United Kingdom. Many clubs exist, including an "official collectors" club sponsored by Wade. There are group meetings for Wade collectors everywhere. Several price guides are available and new collectors should consult them. Wade pieces are easily found anywhere tea drinkers gather. They're also widely available on eBay, at Wadefests, and other gatherings of collectors. They can be found in thrift shops, yard sales, junk stores, antique stores, and local online sales sites. Prices vary widely so do some research before you buy.